We developed a new, small brochure website for Peaceful Solutions Mediation LLC, consistent with our affordable “Basic Billy” web design option. The site is responsive (meaning it adjusts to different size screens), quick, and easy to navigate — all design imperatives. 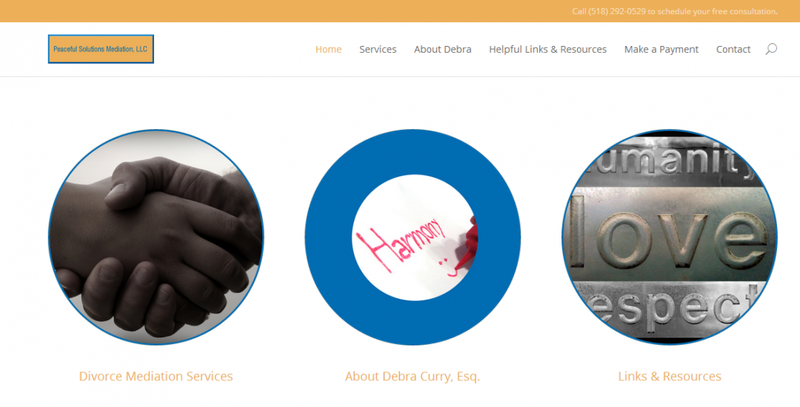 The owner, attorney Debra Curry, needed a site up that provides the basic information about the business entity to visitors. The essentials are there: Contact page, Services, About, Helpful links, and Make a Payment. Speaking of making a payment, we integrated the business’ PayPal account with the website, facilitating easy transactions. We also helped Deb to set up her email, such that she can check her business email from a previously established Gmail account. In addition, we performed a bit of graphic design for the site. We are grateful Peaceful Solutions also chose GoatCloud for website and email hosting (there are a lot of options out there! ), using our affordable, essential WordPress “managed care” hosting plan whereby we make sure the software is kept up to date and the site is secure and backed up. We wish Deb and Peaceful Solutions Mediation LLC the best of luck in this endeavor!